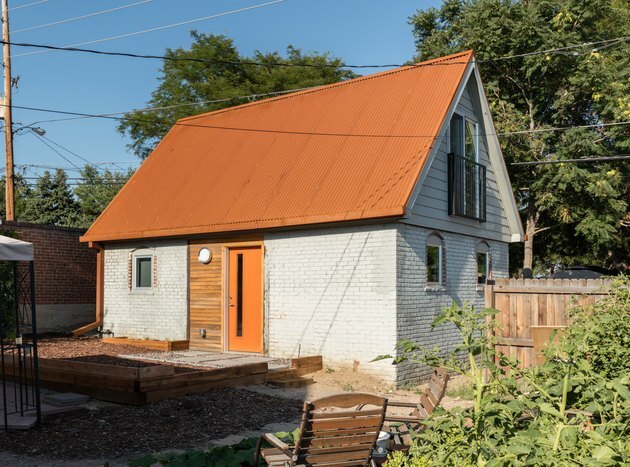 Surrounded by century-old homes in the Sunnyside neighborhood in northwest Denver, an 1800s-era building sat in disrepair for decades before receiving a major upgrade from architecture firm Design Platform, LLC. 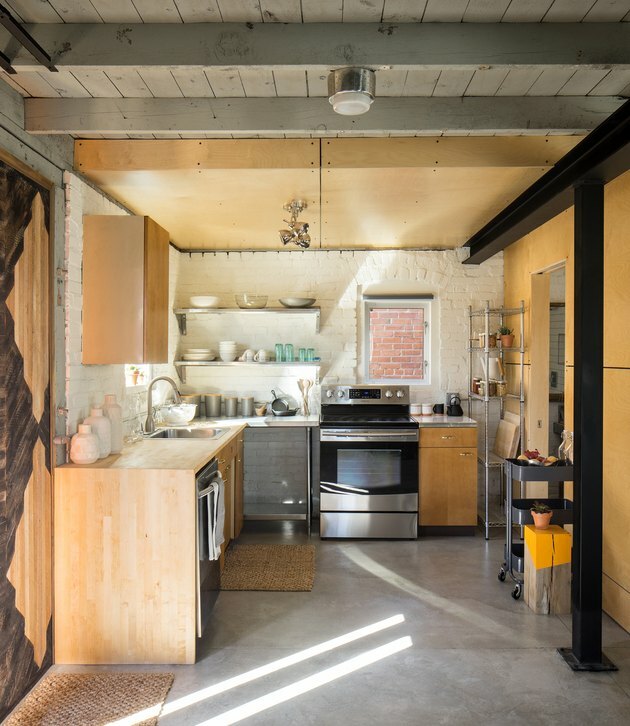 The 700-square-foot structure, with a main floor and bedroom loft, originally functioned as a blacksmith shop for the initial owner who worked and lived out of the now-historic building. 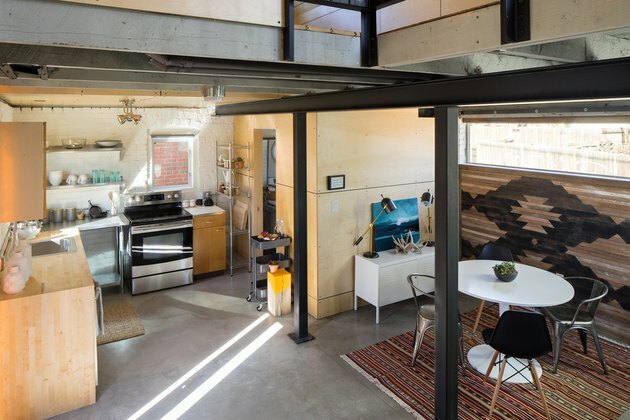 The Denver-based architectural firm kept the original layout but had a lot of work to do on the space — they arrived to a dirt floor, missing windows, and no electricity. Sunnyside has experienced a vast transformation over the past few years with neighbors buying vacant properties and rebuilding the burgeoning area. It was important for the clients — advocates for protecting and preserving older structures in the area — to preserve the history of the home. Thanks to their efforts, a derelict building now has a second life. From the outside, the former blacksmith shop appears to be a modest yet historic building. 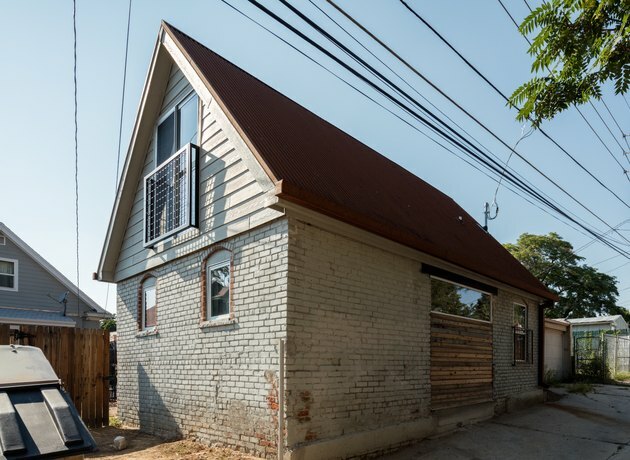 In order to keep the original brick exterior, a concrete floor, steel beam, and steel post were added to properly support the home. 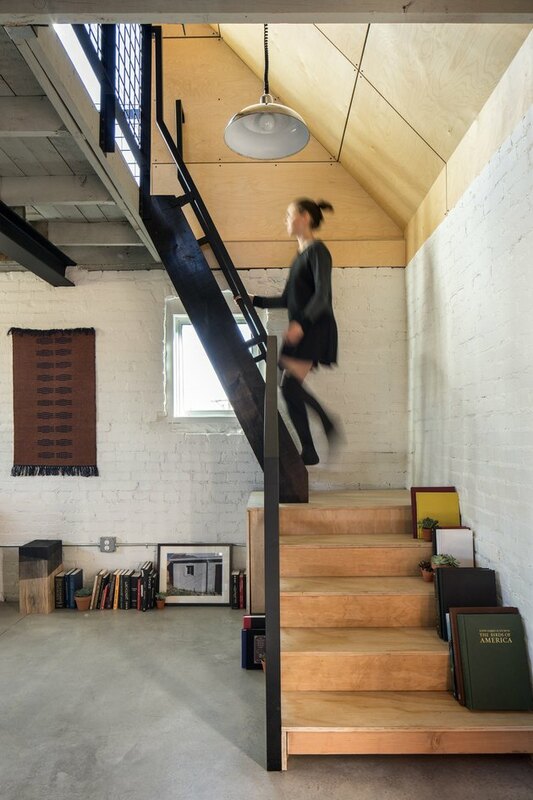 The roof was modified to allow extra headroom for the client's bedroom loft. Metal rods were tied to keep the roof trusses together. Many elements of the home were reused and refurbished, including the original barn doors, which are now used as interior partitions. While rising rent prices and the threat of gentrification loom over the future of the neighborhood, many of the residents have united to preserve the area's important architectural elements. The original brick was left exposed in the interior. Barn doors were original and required no repairs or upgrades. A timeless Saarinen Tulip table is set among an interior design that is a mix of rehabbed historic elements, modern pieces, and rustic art. 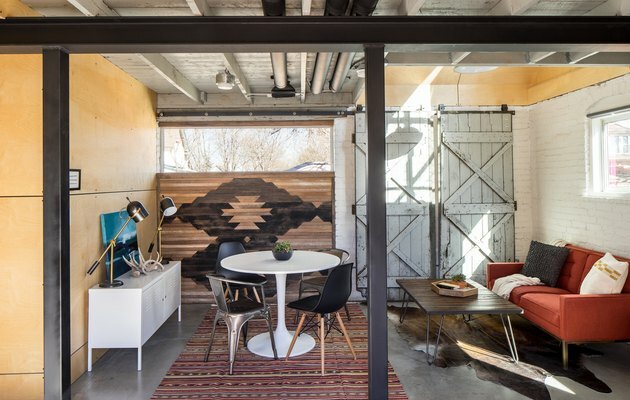 Reclaimed lath from the interior of a 1920s home was used in place of the original barn doors. The lath was redesigned, cut, and stained in order to create a contrast within the pattern. The kitchen was remodeled using a Kohler sink and a Delta faucet. Many of the space's elements and furnishings were taken from other historic homes, including the repurposed midcentury cabinets in their original color, found in a 1950s ranch home. 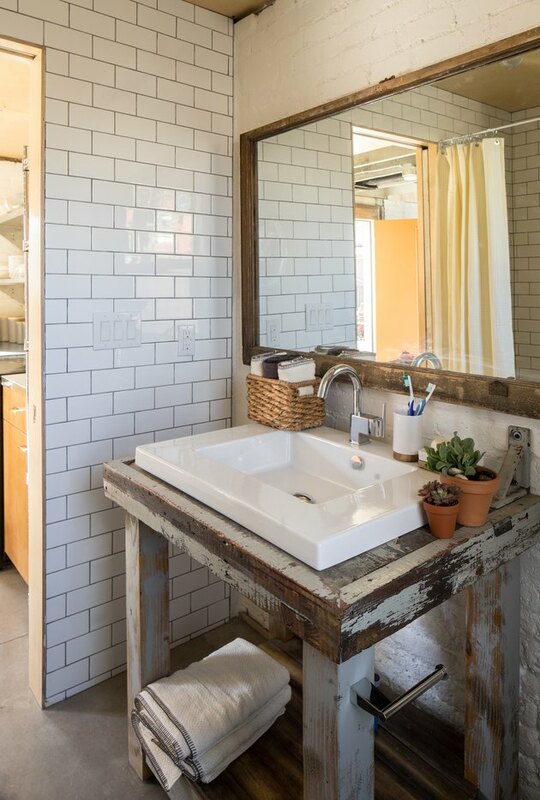 In the bathroom, a repurposed blacksmith bench was transformed into a vanity. The floors were made with poured concrete and finished with a low lustre wax. While painting the brick was a great aesthetic choice, there was also a functional reason for doing so: The paint actually helps hold the 100-year-old brick and mortar together. Ceiling lights in the home were also repurposed from the 1950s ranch home. The metallic elements, like the shelves and the beams, were painted either white or black to create a stark contrast throughout. 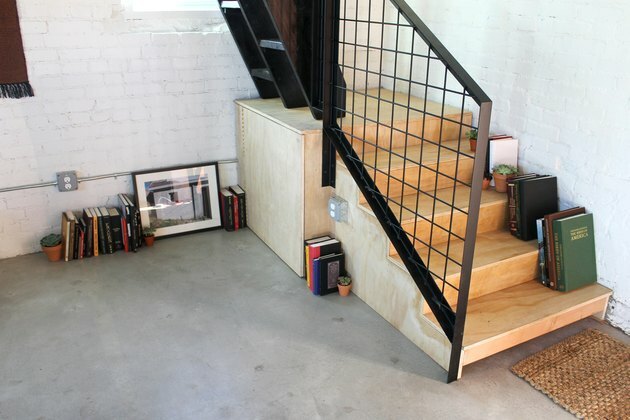 While the white shelves in the kitchen were purchased from a restaurant supply store, the staircase and rail were built and fabricated from the firm's own Platform Workshop. No drywall was used in the renovation. Instead, the firm used finished birch paneling throughout to create a warmer feeling in the open-space home. The ceiling was expanded and built with exposed fasteners in order to give the clients more head room. The firm fabricated and built the nightstands and pendant lights used in the bedroom. 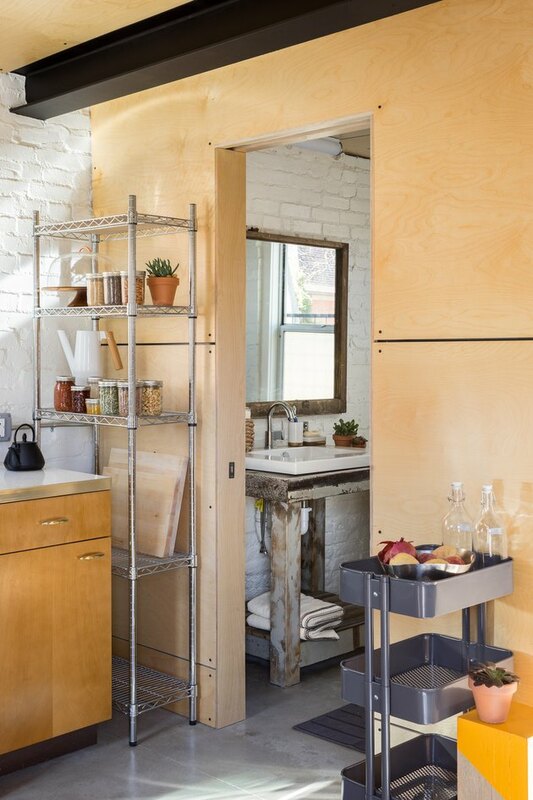 To keep the space more open, they also built the hinged closet rod and created shelves in lieu of building a closet. While the vanity was created from elements found at the blacksmith shop, the mirror was made from a reclaimed window also found in the original building. American Olean white subway tiles line the walls.